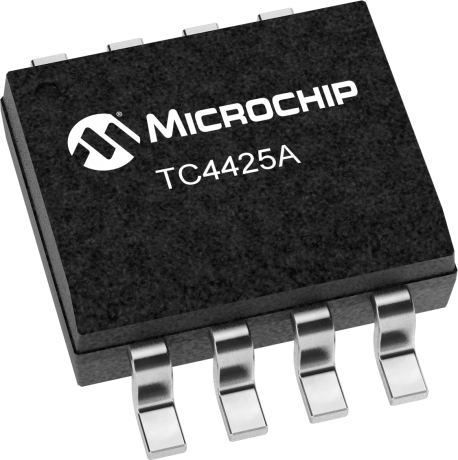 The TC4423A/4424A/4425A are a family of dual, 3A-output MOSFET Drivers, which are high-current buffer/drivers capable of driving large MOSFET transistors and Insulated Gate Bipolar Transistors (IGBT).The TC4423A/4424A/4425A have matched leading and falling-edge propagation delay times and have very low cross-conduction currents that help minimize the overall power dissipation of these devices. This family is an improved version of the earlier TC4423/4424/4425 driver family. The new family features higher peak output current drive capability, matched rise/fall times and propagation delay times. An 8-pin SOIC package option has been added to the family, and the 8-pin DFN package option offers increased power dissipation capability for driving heavier capacitive or resistive loads.